That same site also has a list of events being held around the world. Some have already happened, but check and see if there is one going on in your city. You might be surprised. If you want, you can also see a list of some of the people who are being memorialized today. 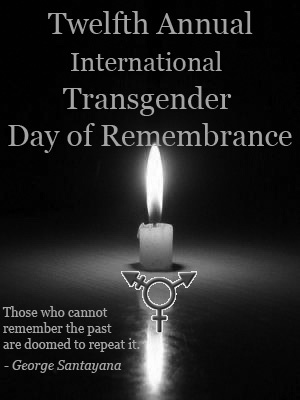 According to the Trans Murder Monitoring project -- yes, that exists -- this year alone there are almost 180 trans persons to be added to the list to be remembered, mourned and honored. If nothing else today, please read the following articles and consider what can be done to make this world safer for all trans people. Colorlines: "Remembering the Transgender Women Murdered Last Year." Missoluian: "Misconceptions, answers about transgendered people." The Bilerico Project: "What Transmisogyny Looks Like." The Advocate: "In Honor of Trans Kids." Chicago Now: "The Pronoun Problem: How to Say it Right."